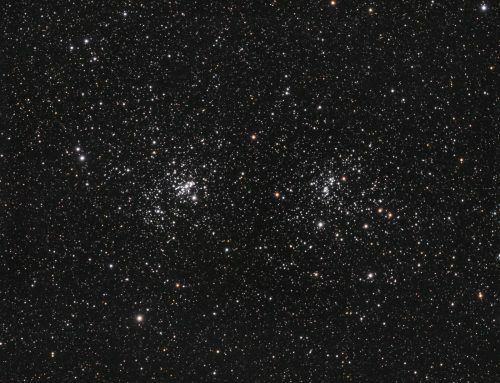 M38 (right) and NGC 1907 are both in Auriga, which is chock-full of open clusters and nebulae. 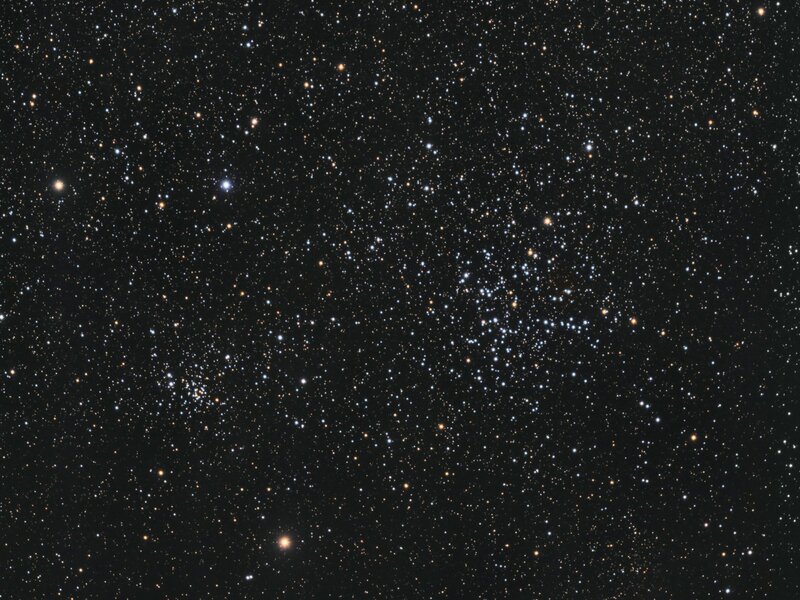 M36, M37 and M38 are all at about the same distance — around 3,480 to 4,500 light years — and close to each other on the sky. 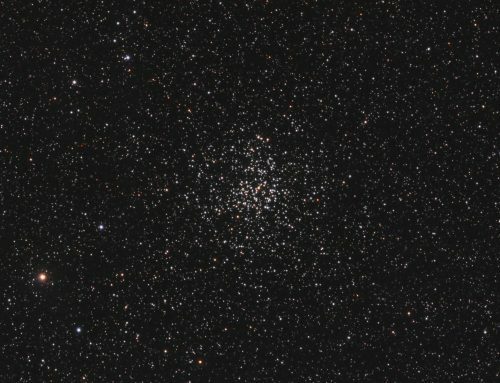 M38 is about 21 light years across and about 290 million years old. 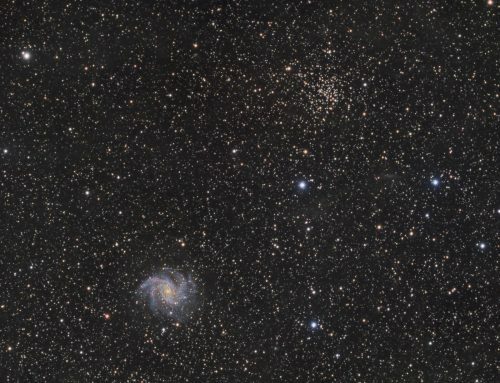 NGC 1907 was formed in a different part of the galaxy and is probably moving past M38 at about 4,500 light years. It is much older than M38, at about 500 million years of age. 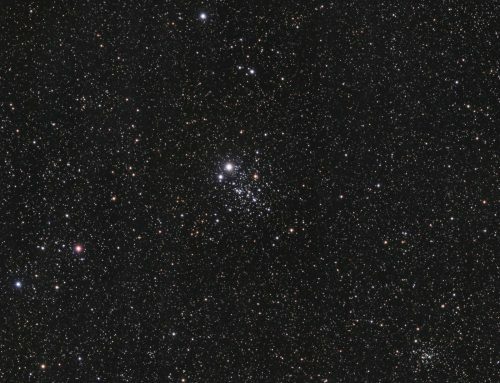 I am aware that there is some nebulosity around NGC 1907, but shooting with a big Moon in the sky meant this didn’t show through in this image. A previous version of M38 at higher resolution is here, although I think I prefer the current image to the older one. For part of this acquisition, I was testing a new prototype Optec focuser for my Sky-Watcher Esprit 150. I’ve used several of their focus products before and all performed flawlessly. This new prototype was no exception. Sky-Watcher Esprit 150 f/7 refractor, QHY 16200-A camera, Optolong R, G and B filters, Paramount MX. Acquisition with TheSkyX unguided. Focused manually using a Bahtinov mask (forst 2.5 hr) and using TheSkyX’s @Focus3 with a new prototype Optec focuser. Automation with CCDCommander. All pre-processing and processing in PixInsight. Acquired from my SkyShed in Guelph. Gibbous to Full Moon, above average transparency and seeing. Data acquired February 19-March 19, 2019. The BatchPreProcessing script was used to perform calibration, cosmetic correction and registration of all frames. ImageIntegration was used to make the R, G and B masters. DynamicCrop was used to crop all the masters identically. DynamicBackgroundExtraction was applied to each master twice, with Division followed by Subtraction. Linear Noise Reduction: MultiscaleLinearTransform was used to reduce noise in the RGB image. Layer settings for threshold and strength: Layer 1: 4.0 0.8 Layer 2: 3, 0.7 Layer 3: 2., 0.6 Layer 4: 1.0, 0.2 Layer 5: 0.5, 0.1. An external mask was used to protect the stars. Stretching: MaskedStretch followed by CurvesTransformation was applied to make a pleasing, bright image, with background set to an intensity of approximately 0.08. Creation: R, G and B masters were combined using ImageIntegration (average, weighted for noise, no clipping). Linear Noise Reduction: MultiscaleLinearTransform was used to reduce noise in the background areas, using an internal mask to protect bright structures. Layer settings for threshold and strength: Layer 1: 3.0 0.9 Layer 2: 2.0, 0.75 Layer 3: 1.0, 0.6 Layer 4: 0.5, 0.2. An external mask was used to protect the stars. LRGB Combination: The SynthL was applied to the RGB image using LRGBCombine with default settings. 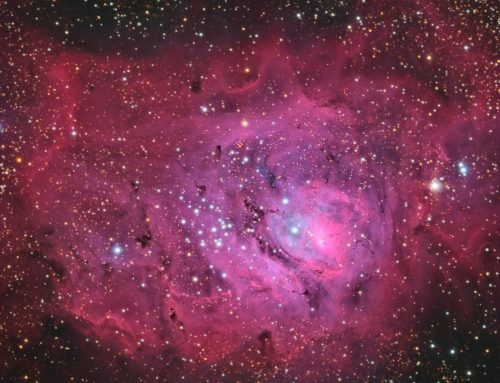 Nonlinear Noise Reduction: TGVDenoise was used in L*a*b* mode to reduce noise with a mask to target the background and protect the stars (max. 1000 iterations and convergence selected for both luminance and chrominance). Final Steps: Background and star brightness, contrast, and saturation were adjusted in several iterations using CurvesTransformation with masks as required.